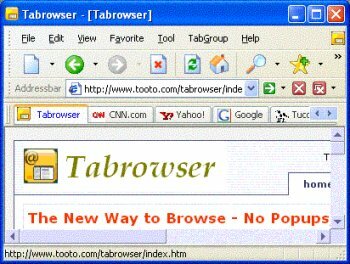 Tabrowser provides a way of viewing multiple Web pages in a single browser window. Each tab in a given browser window is denoted in the tabbed browser. You can open multiple web sites with one click. Tabrowser also has a smart popup killer that intelligently blocks all the annoying popups automatically but doesn`t interfere with the normal opening of a new window. Tabrowser includes a multilingual interface and allows you to: set search pages, set a proxy, set translation pages, assign aliases, import/export favorites, set mail clients, control media, set security, organize address tools, auto refresh, and more.